Something like this could both provide greater transparency to reported issues, as well as letting people who visit the community and see the issue know that it has since been resolved and wouldn't be an issue for them. Jeff Aasim Thanks for your input. We've released an update that includes these features! There is now a dedicated Issues topic type for classifying bugs / problems. 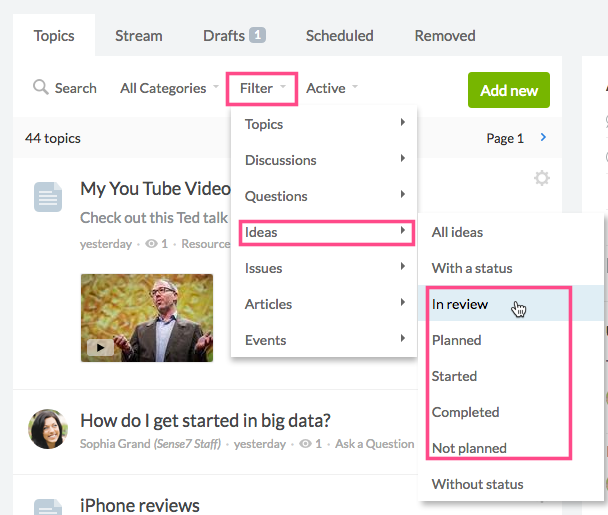 You can also define your own statuses for Ideas, Issues, and Replies. See this post for more details. Hi Jeff , thanks for sharing your feedback! We'll take this into consideration. Which topic type(s) would you likely apply them to, i.e. Feedback, Discussions, and/or Questions? Thanks! I suppose Discussions would be the place. There isn't really a set status for those, as Questions have Answered and Feedback has an array of options for various feature request status. Aasim I think it could definitely work across various fields. Just depends on how you use them. I think it'd be great to just make a custom set of status. Aasim and Jeff thanks for sharing your thoughts here! We are taking this suggestion into review. Awesome! Thanks so much Forumbee Support !! I'm able to add statuses, but I can't delete them... Can someone help with this? Hi Aasim , thanks for your question! If you don't see the delete option, that means the status is in use on one or more posts. You will be able to delete the status after you clear or reassign the status on those posts. Go to Admin > Moderate and select Filter > Ideas (or Issues) and select the status label to view all posts with a status, then use the cog icons to remove/reassign the status. Let me know if that helps!